Hero Dogs, Inc. plans to start our own breeding program once we have a dog older than 2-years of age, with the right temperament, who has passed all of the required health clearances, and we have the available resources to support such a venture. Since it will take some time to develop our own well-established breeding program, we will still rely on puppies from reputable breeders – thank you! Only dogs who come from long lines of confident, yet calm and focused, working dogs and who receive critical handling and social and environmental stimulation in their first weeks of life have a chance of becoming service dogs. We use primarily golden retrievers and Labrador retrievers. In June 2017, we welcomed our first German Shepherd. We have tried other breeds but have found goldens and labs are in general the right size, interested in putting things in their mouths, gregarious, and easy to motivate and train. Of course, many other breeds can be these things too, so we never really know what the next remarkable dog we find may be. However, we do not use dogs with coats which require extensive or professional grooming (for example, poodles or poodle mixes), dogs with extremely heavy or thick coats (like a Samoyed or Akita), or brachycephalic (i.e., short face) dogs (such as a boxer). within about 200 miles of Washington D.C.
We realize that breeders who are conscious of all of these things love their breed. We understand your commitment to your puppies and their futures, and we are cognizant of how much we are asking in requesting a donation of a puppy from one of your litters. It’s hard to express what a service dog means to his partner, and what your contribution to that person’s life would be. You have raised dogs for many years and you know the special bond you achieve with a working dog partner. Imagine if that dog was your lifeline as well as your companion! 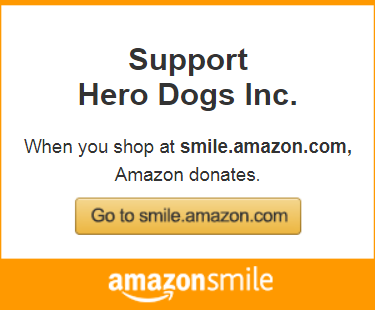 Your gift of a puppy could make that happen for one of our heroes. And of course, your kennel would be acknowledged on our website and in our promotional materials. If you could donate a well-bred and well-raised puppy to our program, now or in the future, please contact us at puppyprogram@hero-dogs.org or call 1-888-570-8653. We would love the opportunity to tell you more about our program and goals and about the life your puppy would lead. Thank you for considering us. 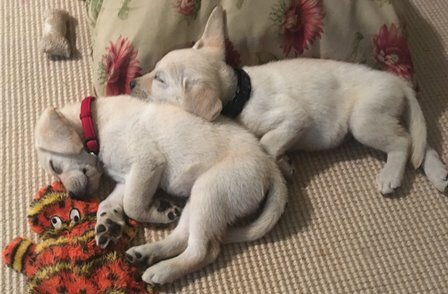 If you cannot donate a puppy but feel you have dogs who meets the qualifications above, please send us an email; we now have the resources to purchase a limited number of puppies.